Last Friday afternoon Chief Joseph H. Lumpkin, Sr. issued a statement to the public regarding violent crime in Savannah. 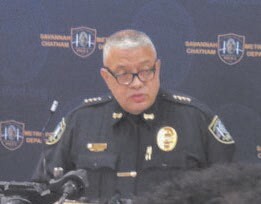 Chief Lumpkin said, “This week the City of Savannah has received national media attention concerning violent crime in our community. As you know we have been regularly discussing crime and those 2015 crime numbers with the City Council and the County Commission. Our violent crime numbers were higher in last year than previous years and our homicides are already double where we were last year – but lower than the rate experienced in October, November and December of 2015. We do not dispute these numbers and we have been very forthcoming and transparent to this community about all the shootings and homicides. An overwhelming majority of the homicides and shootings in Savannah are not random acts. The vast, vast majority of these violent acts do not involve a stranger. In a very great number of these violent acts, the suspect and the victim have been known to each other. And in an inordinate number of cases, the victim was engaged in what is typically termed “risky behavior”. But we can talk about statistics all day. The bottom line is, to the families who are suffering, numbers do not matter! Any one murder is one too many! What matters is mothers are burying their sons and children are losing their mothers to gun violence. In addition, certain neighborhoods are particularly suffering and impacted by gun violence while the vast majority of our neighborhoods are suffering from the fear of crime. We know how serious this is. We are taking this very seriously. For the first time in 16 plus years our police force has reached full staff, but we won’t have all the new officers on the street in solo cars until the end of November. We have stronger partnerships with our citizens, our neighborhoods and our criminal justice partners than we have ever had. This partnership is occurring on the local, state and federal level, both with law enforcement and prosecution. This partnership is occurring on the city-county government level. And most importantly, this partnership is occurring on the neighborhood level and business level. Again, in a transparent mode we have consistently produced the unflattering statistics. We produced our own documentary, much like the CNN story, on our End Gun Violence: Step Forward initiative scmpd.org/endgunviolence/ showing the pain gun violence is causing our children, our mothers and fathers. To some extent this captures this community’s suffering, but it also captures this community’s determination to stop this violence.